Berg was a state – originally a county, later a duchy – in the Rhineland of Germany. Its capital was Düsseldorf. It existed as a distinct political entity from the early 12th to the 19th centuries. The Counts of Berg emerged in 1101 as a junior line of the dynasty of the Ezzonen, which traced its roots back to the 9th-century Kingdom of Lotharingia, and in the 11th century became the most powerful dynasty in the region of the lower Rhine. In 1160, the territory split into two portions, one of them later becoming the County of the Mark, which returned to the possession of the family line in the 16th century. In 1280 the counts moved their court from Schloss Burg on the Wupper river to the town of Düsseldorf. The most powerful of the early rulers of Berg, Engelbert II of Berg died in an assassination on November 7, 1225. Count Adolf VIII of Berg fought on the winning side in the Battle of Worringen against Guelders in 1288. The power of Berg grew further in the 14th century. The County of Jülich united with the County of Berg in 1348, and in 1380 the Emperor Wenceslaus elevated the counts of Berg to the rank of dukes, thus originating the Duchy of Jülich-Berg. In 1509, John III, Duke of Cleves, made a strategic marriage to Maria von Geldern, daughter of William IV, Duke of Jülich-Berg, who became heiress to her father's estates: Jülich, Berg and the County of Ravensberg, which under the Salic laws of the Holy Roman Empire caused the properties to pass to the husband of the female heir (women could not hold property except through a husband or a guardian). With the death of her father in 1521 the Dukes of Jülich-Berg became extinct, and the estate thus came under the rule of John III, Duke of Cleves — along with his personal territories, the County of the Mark and the Duchy of Cleves (Kleve) in a personal union. 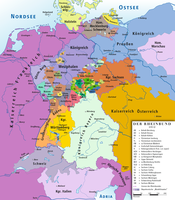 As a result of this union the dukes of the United Duchies of Jülich-Cleves-Berg controlled much of present-day North Rhine-Westphalia, with the exception of the clerical states of the Archbishop of Cologne and of the Bishop of Münster. However, the new ducal dynasty also became extinct in 1609, when the last duke died insane. This led to a lengthy dispute over succession to the various territories before the partition of 1614: the Count Palatine of Neuburg, who had converted to Catholicism, annexed Jülich and Berg; while Cleves and Mark fell to John Sigismund, Elector of Brandenburg, who subsequently also became Duke of Prussia. Upon the extinction of the senior dynasty ruling the Electorate of the Palatinate in 1685, the Neuburg line inherited the Electorate and generally made Düsseldorf its capital until the Elector Palatine also inherited the Electorate of Bavaria in 1777. The ducal palace at Düsseldorf, 1798 copper engraving by Laurenz Janscha. The palace burnt down in 1872. The French occupation (1794–1801) and annexation (1801) of Jülich (French: Juliers) during the French revolutionary wars separated the two duchies of Jülich and Berg, and in 1803 Berg separated from the other Bavarian territories and came under the rule of a junior branch of the Wittelsbachs. In 1806, in the reorganization of the German lands occasioned by the end of the Holy Roman Empire, Berg became the Grand Duchy of Berg, under the rule of Napoleon's brother-in-law, Joachim Murat. Murat's arms combined the red lion of Berg with the arms of the duchy of Cleves. The anchor and the batons came to the party due to Murat's positions as Grand Admiral and as Marshal of the Empire. As the husband of Napoleon's sister Caroline Bonaparte, Murat also had the right to use the imperial eagle. In 1809, one year after Murat's promotion from Grand Duke of Berg to King of Naples, Napoleon's young nephew, Prince Napoleon Louis Bonaparte (1804–1831, elder son of Napoleon's brother Louis Bonaparte, King of Holland) became the Grand Duke of Berg; French bureaucrats administered the territory in the name of the child. 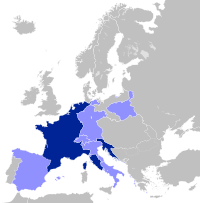 The Grand Duchy's short existence came to an end with Napoleon's defeat in 1813 and the peace settlements that followed. In 1815, after the Congress of Vienna, Berg became part of a province of the Kingdom of Prussia: the Province of Jülich-Cleves-Berg. 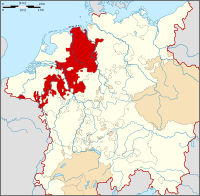 In 1822 this province united with the Grand Duchy of the Lower Rhine to form the Rhine Province. Map of the Duchy of Berg by French cartographer Nicolas Sanson in 1696. The Grand Duchy of Berg in 1812. The historic coat of arms of Berg shows a red lion with a double tail and blue crown, tongue, and claws – blazoned as: Argent a lion rampant gules, queue fourchée crossed in saltire, armed, langued, and crowned azure. This lion originates from the arms of the Duke of Limburg as the Berg title in the 13th century fell to the Limburg line. ^ Pixton, Paul B. (1995). The German episcopacy and the implementation of the decrees of the Fourth Lateran Council : 1216–1245 : watchmen on the tower. Leiden u.a. : Brill. p. 210. ISBN 978-9004102620. ^ Butler, Alban; Burns, Paul (2000). Butler's Lives of the Saints (New full ed.). Collegeville (Minn.): Liturgical Press. p. 56. ISBN 978-0814623879. ^ Knight, Charles (2012). The English Cyclopaedia: Geography. Lightning Source UK Ltd. p. 1030. ISBN 978-1277123517. ^ Encyclopædia Britannica: or, A dictionary of arts, sciences, and miscellaneous literature, enlarged and improved, Volume 3. Google e-books. p. 570. ^ Napoleon’s decree in his quality of Grand Duke of Berg in Intelligenz-Nachrichten, June 24, 1809 (Stück XXV), pp. 341–342. Göttinger Digitalisierungszentrum.